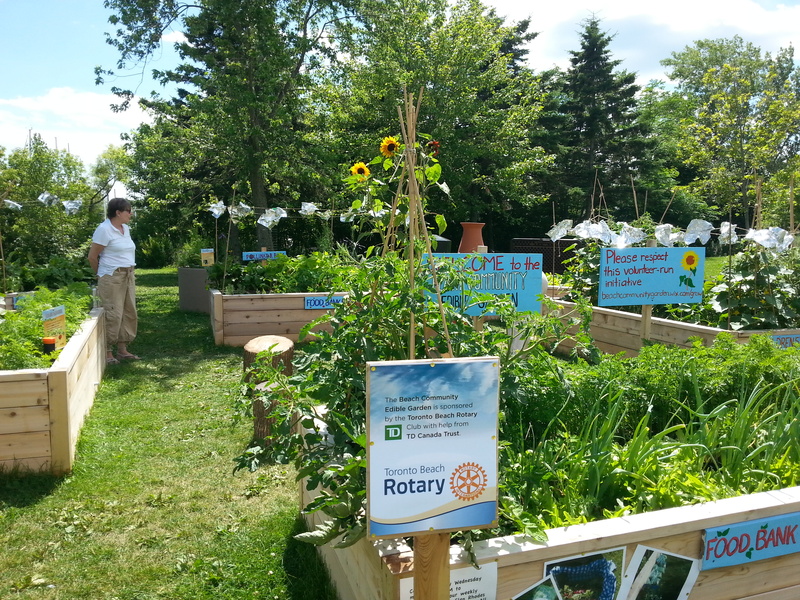 Beach Community Edible Garden is located in Ashbridges Park along the western edge of the boardwalk. Through my experience of working with community groups and being part of urban food groups such as the Scarborough Food Network and Toronto Urban Growers, I have seen a growing (pardon the pun) interest in food production in the city. The most obvious indication of this interest is of course the number of community gardens and allotment gardens sprinkled throughout the city. Along with this traditional approach to growing food comes the side benefit of growing our sense of community. In fact there are several of these unique approaches to Growing Food/Growing Community in the East End. The tending of the garden is done by local volunteers who share the produce with the St. Saviour’s community on Sundays. Extra produce is put into the Neighbourhood Garden Giving Box on Swanwick Avenue and passersby are invited to sample what’s in the sidewalk box. At this point the fruit trees are too small to share fruit—but look for some veggies starting soon! With Kimberley Junior Public School right across the way, the garden gets many big and little visitors. “Neighbours always comment on how much they enjoy the garden, and children like to make special detours through the vegetable patch,” said Virginie. Any of you who take the streetcar along Queen St. East will have seen the metal planters at Ashbridges Estate—this is the Ashbridges Food and Learning Hub (AFLH). Started by Lisa Kates and Darcy Higgins of Building Roots this social enterprise venture is a pilot urban food project showcasing a unique way to farm in Toronto. AFLH is a collaborative effort involving Building Roots, the Ontario Heritage Trust, who supply the land, and Toronto Community Housing who supply the planters. Other support comes from The Black Farmers Collective, ByNature and the Ojibiikaan Indigenous Cultural Network. Some of the food grown goes to growers and volunteers but the majority of it travels two kilometres down Queen Street to supply the Friday and Saturday community market at Moss Park. This is a new approach to supplying community with fresh, healthy food—no longer does it have to come from a distance—it is grown right down the street. Lisa would like to invite the surrounding community to explore the garden. “Come and see what is growing in your own neighbourhood. You are doing good!” she said. Visitors are also invited to take samples from the metal planters in the front. Building Roots welcomes neighbourhood volunteers, and with the heat this year they could use additional help tending to the thirsty crops. Volunteer training is provided. What a great way to learn about farming, learn new skills and make new friends! If you are interested then please contact them at http://buildingroots.ca/. As a regular walker at Ashbridges Park I always drop in to see what is new at the Beach Community Edible Garden. Started three years ago by the Friends of the Beach Parks (that great group who operates the winter firepit by the rink in Kew Gardens) and built on land generously donated by City of Toronto Parks, this raised bed garden delights passersby with its plantings and the informative and colourful signs. According to Adam Smith, one of the core volunteers, the planters are a special design as they act as wicking beds, meaning that water is dispersed from the ground up. The BCEG sends most of its produce to the Glen Rhodes Food Bank but there is one container that welcomes public sampling (clearly marked by a sign).Built by over 20 volunteers, the garden continues to be worked on by a core set of seven volunteers—one of the key members being the “master gardener” named Skye Vanderberg. But with the number of heat waves that have hit Toronto, the BCEG could use more help with watering and weeding. Adam has already enlisted me to weed each time I go walking there! If interested please contact them at beachcommunityediblegarden@gmail.com. This new group in the Beach was started by Adam Smith (see BCEG above) and was inspired by the Swedish neighbourhood approach to gardening where neighbours pool resources and share in gardening and harvesting. Adam looked for a comparable approach for the Beaches and came upon the Grow Food Not Lawns movement. Presently standing at 10 members the Beaches group shares gardening knowledge, seeds, seedlings and harvests. “The best part has been the opportunity to meet like-minded people, share advice, seeds and tips, and learning to grow together,” said Adam. “We are building community.” Anyone is welcome to join and if interested look them up on Facebook. Farmers’ Market, to the Thursday East Lynn Farmers’ Market and the Sunday markets which include the Leslieville Farmers’ Market and Market 55 at Main Street and Swanwick Avenue. As they are great places for community gathering, learning and sourcing local, healthy food, these markets have been a welcome addition to our neighbourhoods. All of the projects that I mentioned above would not have happened without the support of a number of volunteers! Please volunteer—it is a great way to meet and support your community! Katie Fullerton has lived in the Upper Beach for over 20 years. Through her work as a Live Green Toronto Community Animator she learned the importance of community support in greening up Toronto. She is a past member of East Toronto Climate Action Group and is a member of Greening Ward 32. Katie is also a member of Toronto Urban Growers and coordinates the annual Scarborough Seedy Saturday and Green Fair.